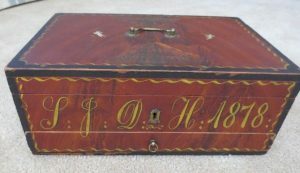 Initialized “LG DH 1878” New England origin. Quite possibly a wedding gift with initials of bride and groom. 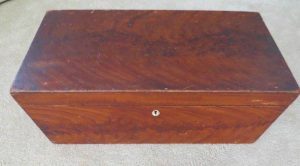 Paint decoration and box in superb condition. Original hardware and key. 15 in. L x 9-3/4 in. D x 6 in. H. Old small stickers and later paint (white) on inside top part of box. 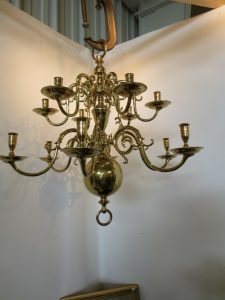 Superb brass chandelier in the early Dutch style. Hand made in the 1900’s. Mint condition. Comes apart. Two tiers and twelve 12 candles. 24 inches high and 26 inches wide. 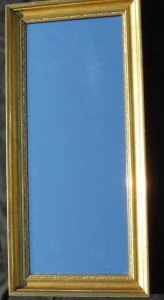 20th century gold mirror, 21-3/4 x 38 in., with 3 in. wide molding. 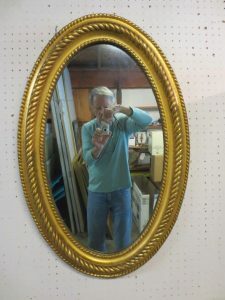 Mirror in ci. 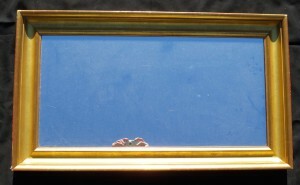 1830-1850 gold leaf cove frame. 23-1/2 x 35-1/2 inches with 3 inch molding. 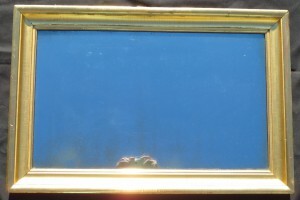 1860’s lemon gold mirror, 21-1/4 x 45-1/4, with 3 in. wide molding. 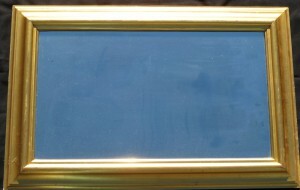 Decorative element on the inside edge of frame. 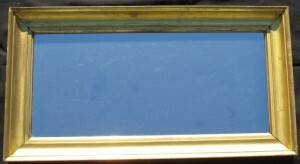 Bolection (“hump in the middle”) mirror, made 1860’s, 24 x 37 inches, with 4 in. wide molding. Repair on the hump on one short side. 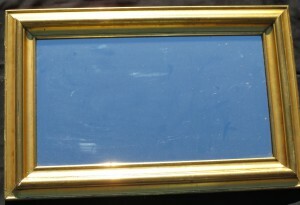 Gold leaf oval mirror made in 1860’s, 22-1/4 x 36 inches, with molding width of 3 in. 1820-1830’s cove gold leaf mirror, 19-1/2 x 36-1/4 in., with 3 in. wide molding.